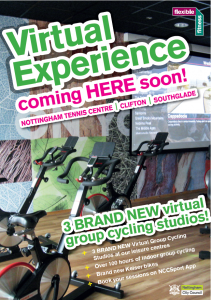 Join us for one of our Spivi VIP launch events and be the first to see our brand new Spivi Studio and experience an outdoor community cycling experience, indoors! There will be virtual sessions running on the hour and half hour with Group Fitness Instructors and Fitness Advisors on hand to support you. Bring along friends and family FREE of charge to join in the sessions too! We know you’ll all love it and want to come back, so we’re offering an exclusive VIP “no joining fee” flash sale when you sign up to a Flexible Fitness membership package on the night! There’s a FREE raffle to win fitness merchandise along with refreshments and a chance to use our great gym facilities too! So what are you waiting for, tag your friends and join us for our VIP launch, Hollywood style! Dress code : Black tie – just kidding, your workout kit will be perfect, especially if you’re going to “get on your bike”! Spivi sessions are FREE as part of our Flexible Fitness Membership package, so if you’re not already a member, why not sign up at the event? It really is great value for money and gives you access to 8 leisure centres, 7 swimming pools, over 400 fitness classes and steam rooms and saunas too!